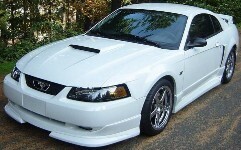 White 2001 Mustang with Roush body kit and a Roush modified 281 cubic inch (4.6 liter) V8. This car has every Roush 2001 option but the stage 3 supercharger. Mineral Gray 2001 Roush Stage 3 Mustang convertible owned by Bruce Koehler from Lakeville, Minnesota. It has a 4.6L V8 engine, a manual transmission, and only 19,000 miles on the clock. This is our featured Attitude Of The Week for the week starting January 19, 2014.